Gift shopping is stressful- especially when you are down to those last people on your list who, for one reason or another, are just impossible to please. Here are some of my favorite sites to pleasantly surprise even the most persnickety person in your life- and you can see the entire segment HERE. She unwraps the gift and squeals with joy. A week later, you spot it in the back of her closet. The new and improved of-the-month clubs (major trend right now) were made for her. Birchbox: Beauty goodies from the best brands in the business arrive every 30 days, complete with tips and tricks. Citrus Lane: A new mom and dad life saver, amazing must-haves for little ones picked by a panel of parenting pros. Lollihop: A sampler of nutritious snacks, perfect to get 2012 off on a healthy foot. This one takes careful note as to where the gift comes from- bag, tags and all. N0 sneaking by with off-price retail or flash sale site finds here. 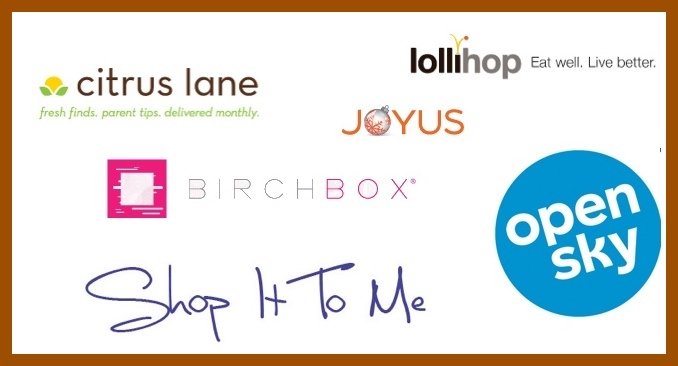 Shop It To Me: Create a profile with favorite brands and retailers and you will be alerted daily via Shop It To Me's salemail when relevant items have gone on sale- so you can score deep discounts on finds from Saks, Tory Burch, J. Crew, Thomas Pink and others. They will all arrive wrapped directly from the source- dressed to impress, so to speak. Every year around this time you ask yourself- how am I possibly friends with this person?! Their interests are so different from yours, you wouldn't even know where to begin. Best place to start? Websites featuring picks curated by tastemakers in all kinds of categories. Joyus: If your friend is fashion or beauty obsessed, and you aren't so much, this site, which features video sales showcasing insider's personal favorite things, should be your go-to resource. I share many of my must-have items on there, along with a stable of professional stylists, makeup mavens and fashion fanatics. Plus, the videos feature tips and styling advice- so they can become a resource for the recipient to make the most of their new gift. OpenSky: I frequent this site for foodie and health nut gifts, and personally I am also obsessed with the finds from their parenting and organization curators. If you want to know what people with all kinds of passions will want this season, log on to peruse and purchase picks from pros like Preston Bailey, Tom Colicchio, Alicia Silverstone, Padma Lakshmi and many more. Trends be damned- for this person, uniqueness is everything. Scouting out limited edition quality finds is made infinitely more simple on a site when someone else does the hunting for you. Of A Kind: Showcasing a different designer each week, Of A Kind commissions exclusive runs of anywhere from 5 to 50 units of any given item- and it arrives authenticated, numbered and signed by the creator. Plus they always share the back-story, so you can sound all smart and informed about the gift you give.